There is literally so much going on in this episode we don't know where to start. In fact, we're still frazzled by it all and are going to need an hour or two to come down off this Scandal-induced high, which is not what we need during the already stressful holiday season. This episode moved at a mile a minute, and the terse monologues were even tersier. See? We told you we're frazzled. Luckily we've got a few Scandal-free weeks to digest everything, so everyone has plenty of time to read — and then reread — our Ridiculist. We'll be back to brighten up your Thursday nights on February 27. This whole blood-and-guts trend is really not working for us. We turn to Scandal for over-the-top drama, not to see people's insides splashed about on a weekly basis. We know this is totally beside the point, but Quinn can really work the high pony. Feeling. It. "The devil came in" is officially our new catch phrase. Especially when we're looking for an excuse for taking too many tequila shots at the holiday party. Too soon? Not to be disrespectful, but Rowan, please. Fitz doesn't give a crap about whether you approve of him "seeking your daughter's hand." We never thought we'd be defending their relationship but there you have it. This show is so rife with disturbing relationships that we just don't know where to begin. When Abby and David are the most promising couple you know you've got problems. Back to the Fitz-Rowan standoff. We have to admit that we haven't been paying much attention to this plotline tonight because we're so weirdly turned on by POTUS' new 'tude. 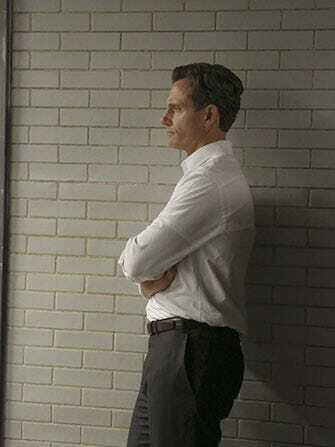 Helloooo Fitzgerald Grant III. Has anyone ever done a count of how many times a Scandal plotline changes direction within a single episode? By our calculations that number is approximately thirty seven. Also, where is this "baby" they keep speaking of? We get that working with child actors is tough, but even a picture would be appreciated at this point. How does Eli Pope sleep at night? And we don't mean metaphorically, because of his questionable moral decision. We mean literally, how does he find time to close his eyes? We'd like to know his secret. Or Cyrus', for that matter.